This lovely, law-abiding dude apparently showed up at a South Carolina Wal-Mart on Saturday under the influence of something. Let's let the cops explain what happened. 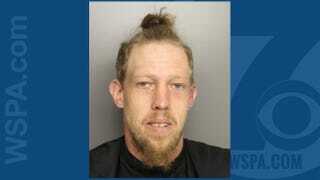 According to Greenville County Master Deputy Jonathan Smith, deputies responded around 1:00pm Saturday to a call about an intoxicated man outside the Walmart. He said the first deputy arrived to find the man acting erratic outside the store. The deputy approached the man and tried to speak to him. The man apparently kept repeating "I'm 911" to the deputy before walking away inside the store. That doesn't sound good. The entertainment continued inside. The sheriff's office released Walmart surveillance video on Sunday they said shows Sierad tried to steal a cash drawer at the store on Saturday, reached for a deputy's knife three times in the parking lot, and resisted arrest — even trying to jump in the back of a moving truck to escape a deputy. They tried to tase him repeatedly, without effect. Time to open fire? Apparently not. Instead, they wrestled him to the floor and proceeded to beat the crap out of him while bystanders pulled out their phones. Some questions are being raised that the beating was excessive. Oh well.